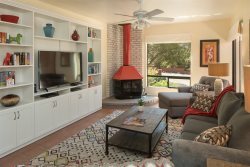 This southwestern style condo is located in the heart of West Sedona in the Nepenthe Condo Community. Offers a community pool and hot tub, beautiful landscape and grounds throughout the complex. This condo is an end unit that offers privacy. Great southwestern, Spanish touches throughout the interior. Comfortably sleeps and sits 6 people. Located just a mile off 89A from shopping, restaurants and local businesses. Close to hiking and biking trails! Pets: No pets allowed at this property. It has a seasonal community pool, heated May thru September, possibly additional 2 weeks in April or October, depending on the weather & temperatures each year. Hot tub is open year round. Children undlowed in hot tub. No alcohol, glass or food in the pool area. There is no on street parking. Cars must be in gaer 12 and/ornot alrage carport. Not in guest parking spaces. Cars mus be 18' or less long an less than 70" high to fit in the garage. No RV parking allowed. I love 422 Desert Poppy and must stay in Napenthe properties. Nothing else measures up to those properties. I am able to write books at 422 and find it perfect for my writing needs! Cherry and Kim are real troupers as well as the beautiful staff in all arenas of Foothills, especially the front desk who know where everyone is at all times even iof they are out in the field. The property needs a little work on it right now and in time I know it will be even better but I have always loved this house that is for sure as I have written many of my main books here and is nice and quiet for a working artist, writer, entrepreneur. A great house in Sedona for ambiance.